Guys aren't exactly known for being the most knowledge when it comes to the topic of female biology. But one Twitter user's took the biscuit in a hilarious text message exchange that Twitter user @vnsamre decided to share on Twitter. Last night, @vnsamre was running a fever, so she decided to share a photo of the thermometer, reading 100F, with her boyfriend, Izaak. 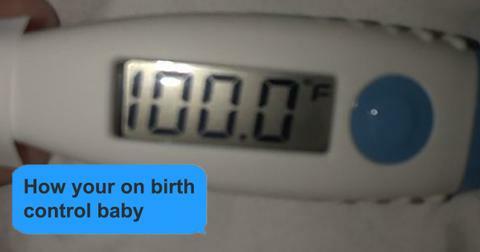 For some reason, Izaak seemed to believe that the thermometer was a pregnancy test. Of course, he was pretty shocked to learn her was going to be a father to 100 babies. Or maybe he thought she was 100% pregnant? Poor Izaak isn't going to hear the end of this for a while. "Im guessing he has never seen a thermometer or a pregnancy test before," one Twitter user joked. Women seem to have had similar experiences with men, though. "I showed this to my friends while we were getting coffee and we laughed so hard," one commenter wrote. "POOR GUY MUST HAVE HAD A MINI HEART ATTACK BUT HOW CAN HE NOT KNOW HOW A THERMOMETER LOOKS LOL." While another shared a similar experience: "You're okay hun my boyfriend thought macaroni wasn't a pasta." And somehow this same mistake has happened more than once?! This isn't the first time a woman has pranked her boyfriend and shared it on social media for the world to enjoy. Recently, Twitter user @kelllicopter proposed the following challenge to women: screenshot a copy of your conversation with your boyfriend after telling them you want to have a baby and upload it to Twitter. You can read all about the hilarity that ensued there here.